Dens invaginatus (DI) is a rare developmental dental malformation caused by an invagination in the surface of tooth crown before calcification. It occurs rarely in the primary teeth with a general prevalence of 0.04-10% and there is 3:1 female predilection. The condition commonly affects the maxillary lateral incisors and its occurrence in the mandible is extremely rare. Radicular DI results from an enfolding of Hertwig's root sheath and originates within the root after development is complete. 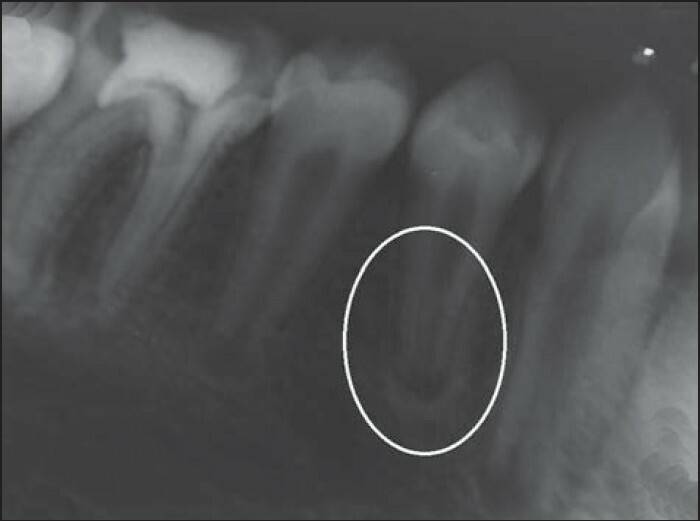 The affected teeth radiographically show an infolding of enamel and dentine which may extend deep into the pulp cavity and into the root and sometimes even reach the root apex. Tooth crowns as well as roots may exhibit variations in size and form. , Here, we present an unusual case of bilateral radicular DI in mandibular first premolars in the early stage of its development; that showed distinct clinical and radiological features. 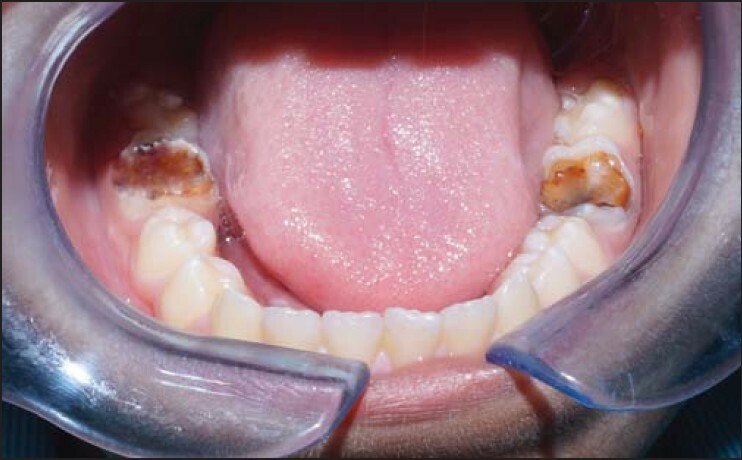 A 11-year-old male child presented with a chief complaint of spontaneous, severe and a nocturnal pain in his mandibular right posterior tooth. Patient and his parents were made aware in advance that the facial photograph will be used for the academic and publication purpose. After the explanation to the patient, written informed consent was taken in local as well as in English language for the same. Proper institutional protocols regarding ethical issues have been followed. Conflict of interest is disclosed as Nil. There was no significant medical and family history. Extraoral examination revealed no abnormalities. Intraoral examination revealed decayed mandibular right and left first molar [Figure 1]. The routine intraoral and panoramic radiographic examination was done. 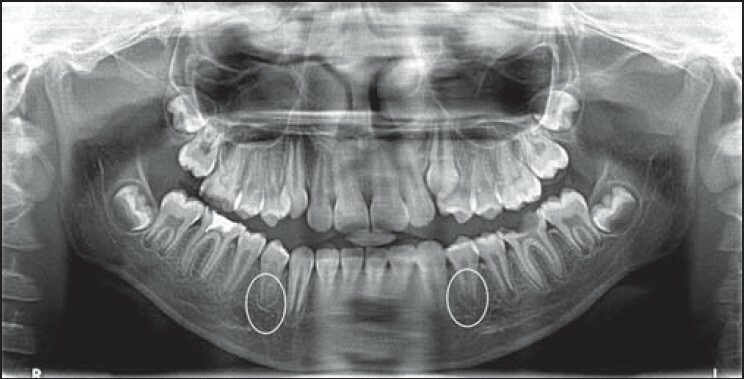 Intraoral periapical radiographs with respect to (w.r.t) 36 and 46, revealed dental caries invading the pulp [Figure 2] and [Figure 3]. 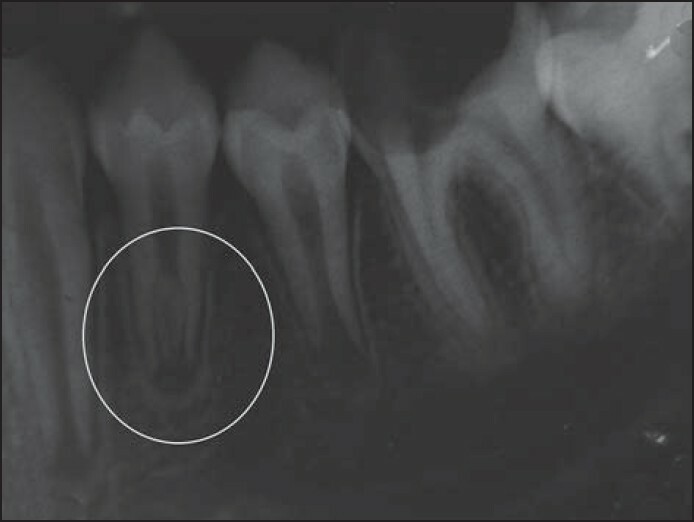 On panoramic radiographic examination besides dental caries w.r.t 36 and 46, a well-defined invagination into the pulp canal from the radicular portion of mandibular right and left first premolars was noticed [Figure 4]. The anomalous condition was classified as radicular dens invaginatus. The pulp extended from the apical foramen towards the cervical region of both the teeth. As the patient did not have any complaint related to the mandibular premolars, the treatment planning was limited to pulpectomy, followed by porcelain fused to metal crowns w.r.t 36 and 46. The follow up visit was given after every 3 months to observe any pathology developing from the bilateral radicular dens invaginatus. Type I: An enamel-lined minor form occurring within the confines of the crown not extending beyond the amelocemental junction. Type II: An enamel-lined form which invades the root but remains confined as a blind sac. It may or may not communicate with the dental pulp. Type III: A form which penetrates through the root perforating at the apical area showing a "second foramen" in the apical or in the periodontal area. There is no immediate communication with the pulp. The invagination may be completely lined by enamel, but frequently cementum will be found lining the invagination. The Type I is represented as an axial in-folding of a wall of the root and it indicates an incomplete attempt at root bifurcation. It does not display the morphologic and clinical characteristics common to other forms of DI. The Type II is regarded as true form of "DI" that is extremely rare and represented as an enamel-lined invagination within the root originating at an opening on the root itself. In DI cases, the invagination area communicates with the oral cavity that allows the entry of irritants and microorganisms, which usually leads to infection and necrosis of the pulpal tissue and periodontal or periapical abscess. Various treatment modalities have been reported including conservative restorative treatment, nonsurgical root canal treatment and surgical treatment like endodontic surgery, intentional reimplantation and extraction. , In this case report, patient did not have any complaint related to radicular DI. For this reason, the patient was recalled follow-up sessions for every 3 months to assess the anomaly. The present case is an example of Oehlers Type III DI, and Type II form of radicular DI. Hence, our case is reported to be the rarest case of radicular Dens invaginatus, with both the rare classifications together. 1. Sabhlok S, Dhull KS, Sahoo A, Panda S. Radicular dens invaginatus in mandibular third molar: A rare case report. Int J Oral Maxillofac Pathol 2012;3:44-7. 2. Hülsmann M. Dens invaginatus: Aetiology, classification, prevalence, diagnosis, and treatment considerations. Int Endod J 1997;30:79-90. 3. Bhatt AP, Dholakia HM. Radicular variety of double dens invaginatus. Oral Surg Oral Med Oral Pathol 1975;39:284-7. 4. Soames JV, Kuyebi TA. A radicular dens invaginatus. Br Dent J 1982;152:308-9. 5. Beena VT, Sivakumar R, Heera R, Rajeev R, Choudhary K, Panda S. Radicular dens invaginatus: Report of a rare case. Case Rep Dent 2012;2012:871937. 6. Oehlers FA. Dens invaginatus (dilated composite odontome). I. Variations of the invagination process and associated anterior crown forms. Oral Surg Oral Med Oral Pathol 1957;10:1204-18. 7. Oehlers FA. The radicular variety of dens invaginatus. Oral Surg Oral Med Oral Pathol 1958;11:1251-60. 8. Ridell K, Mejàre I, Matsson L. Dens invaginatus: A retrospective study of prophylactic invagination treatment. Int J Paediatr Dent 2001;11:92-7. 9. Payne M, Craig GT. A radicular dens invaginatus. Br Dent J 1990;169:94-5. 10. Pandey SC, Pandey RK. Radicular dens invaginatus - A case report. J Indian Soc Pedod Prev Dent 2005;23:151-2. 11. Neves FS, Pontual AA, Frazao MA, Almeida SM, Ramos P. Radicular dens invaginatus in a mandibular premolar: Cone-beam computed tomography findings of a rare anomaly. J Oral Radiol 2013;29:70-3.